Working our way through all these leftovers is daunting, to say the least. Reliving the Thanksgiving feast just isn’t that appealing to us and with only three unenthusiastic eaters to work on it, too much is sadly going to waste. Last night, in an effort to create dinner from what I had on hand, I threw these together, to positive reviews. They only took about 10 minutes to prep and made a slight dent in the bountiful array of foods filling up my refrigerator. Not the best photo, but it’s all I could get before they got devoured. This is the ultimate unrecipe, designed to use what you have, so feel free to be flexible with ingredients. Saute one finely diced shallot in butter. If you don’t have a shallot, use an onion. Add diced carrot, and celery if you have it, and keep cooking until the shallot is transparent and the carrots are softened. Mix in chunks of cooked turkey, and sprinkle it with cornstarch or flour. Toss until everything is coated, and the flour is no longer visible. Slowly add turkey stock, or chicken broth, bring to a slow boil and stir until thickened. Go easy here. If it isn’t thick enough, mix some of your cornstarch or flour with some hot broth and stir it in. If it gets gloppy, add more broth. At this point, I added some frozen peas. You can add whatever vegetables and herbs you have. Season with salt and pepper and transfer to an ovenproof dish. Bonus points if you made this part in an ovenproof skillet and don’t have to wash another dish! Place biscuits on top of the mixture. Mine were already lightly baked, and very high, so I sliced them in half and brushed them with melted butter and little Maldon sea salt, ’cause I’m fancy. Place in the oven at 350 degrees and bake until the biscuits are hot and browned about 5 minutes. If you don’t have leftover biscuits, you can use the ones from the tube and bake according to directions. No biscuits, no problem. This filling could go into a traditional pie with a top crust, or atop those frozen puffed pastry shells instead. Baking times will vary according to your pastry preference. 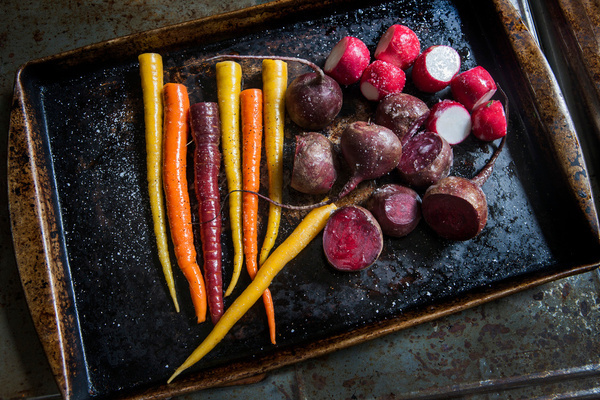 Rainbow carrots, beets and radishes, ready to roast. I bet those carrots would have made a delicious hummus too! Once again, I am in the throes of Whole 30, a healthy elimination diet that is geared towards breaking up with the foods that may be inflammatory to you for a whole 30 days, in effort to better your health, and change your relationship with food. Similar to the Paleo diet, it encourages you to eat fresh, whole foods and eliminate grains, dairy, legumes, sugar, alcohol and anything processed. That pretty much leaves you with fruit, vegetables, meat, poultry, seafood and eggs, with a few nuts ( not peanuts!) thrown in for good measure. Unlike the Paleo diet, any form of sweetner, or foods that are compliant, but resembling other foods, are out of the question. Read: alternative grain pancakes, breads or pastas etc. Most of the time, it’s not so bad, but as the days wear on, it can get a bit dull. Couple that with not being a meat eater and it gets really dull. I thumb through recipe books to find interesting vegetable dishes, and dismiss many of them for having a non-compliant ingredient. Beans, grains, a little crumbled cheese or a drizzle of honey disqualifies the dish from Whole30 compliance. I’m not dying for a pizza, or a cookie; just a new texture, or flavor profile to break up the monotony of it all. 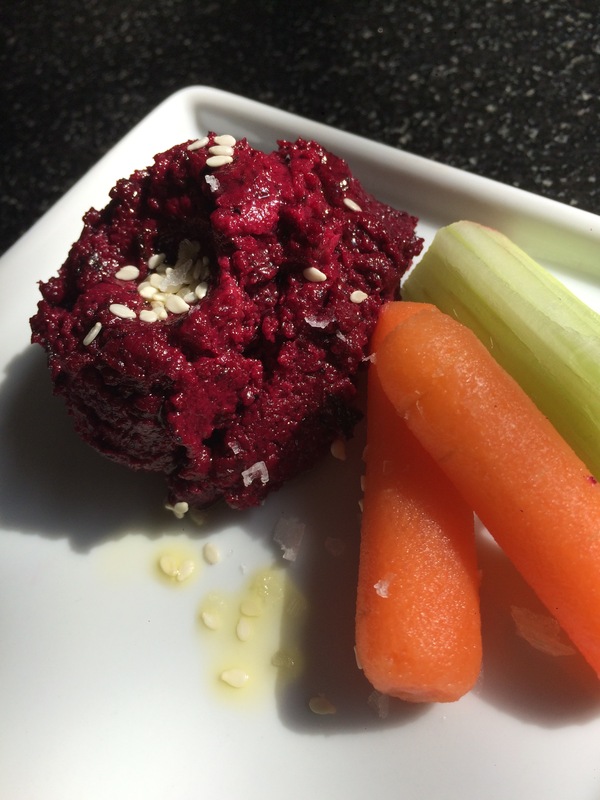 Today, I made a roasted beet hummus accompanied by a pile of raw vegetables to dip in it. The creamy consistancy, the beautiful magenta color and the jolt of tahini hit all of my senses in new way. It’s a great snack, and pairs well with a simple piece of broiled salmon, or a bowl of cold shrimp. Tahini, made of sesame seeds, is also a source of plant based protein. Although hummus is traditionally made from garbanzo beans ( chick peas), it is much like making pesto, where the main ingredient is easily changeable with interesting results. Scrub and trim 3 or 4 beets and toss them with olive oil and a sprinkle of sea salt. Roast for about 1 hour at 375 degrees until they are easily pierced with a fork. Once they are cool enough to handle, rub them gently to remove the skin. Place the beets in the bowl of the food processor with a clove or two of garlic, about 1/4 cup of tahini, and the juice of a lemon. Blend until smooth. Taste to correct flavors. Beets vary in size, so you may need to add more tahini, lemon, salt or garlic depending on your taste. Serve drizzled with a little olive oil and sprinkled with toasted sesame seeds as a garnish if desired. Check out our post on Cauliflower Hummus for another variation. Photos by Glasshouse Images and indigo jones. We’re always dreaming up new salads to help our catering clients get their greens. 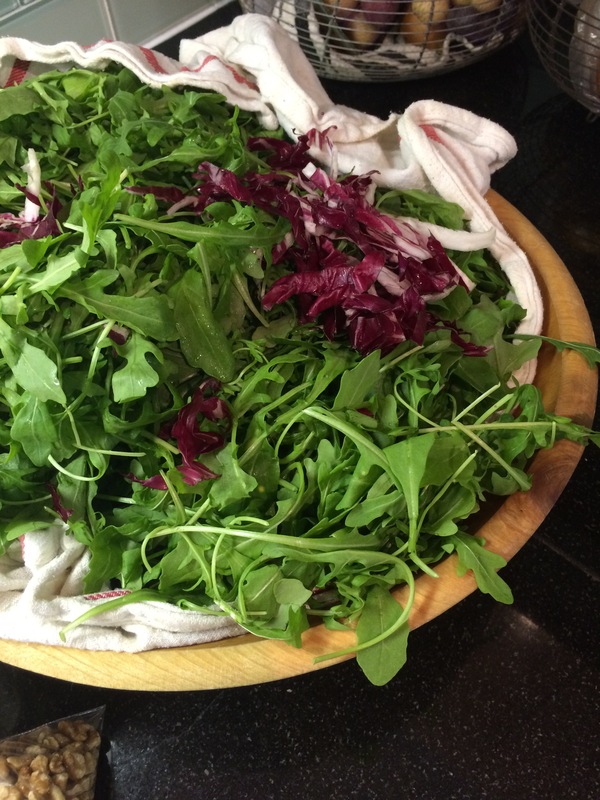 This week, we were inspired by a recipe from Giada De Laurentiis for an arugula, radicchio and pear salad. That’s all we needed to know, to set us off on our own journey towards salad greatness. We started with the greens, and built it from there. Adding sliced pears (soaked in lemon juice to keep them from browning), ricotta salata cheese, and a sprinkling of toasted walnuts for a finishing touch, we dressed it in a honey, dijon dressing that was just the right balance of sweet and tart. This is light enough to be a starter, and interesting enough to be the centerpiece of a meal, with a little sliced chicken or some white beans to up the protein quotient. Wash baby arugula and radicchio, cored and sliced thin and place it in a bowl. Slice ricotta salata and pears into thick matchsticks. Toss with Honey Dijon Vinaigette, and sprinkle with toasted walnuts. Whisk together 1/4 cup olive oil, 2 tablespoons of balsamic vinegar, 1 heaping teaspoon of dijon mustard, 2 tablespoons of honey, 1/2 teaspoon of salt, and 1/4 teaspoon of pepper. Be sure to taste, and add more vinegar if it seems too sweet. BONUS: Don’t limit yourself to salad! I used this vinaigrette on a simply broiled piece of salmon and it was delicious! It was just thick enough to coat the fish, and give it a tasty glaze. Yum! Last week, I was looking for a few great side dishes that were hearty enough, and interesting enough for a vegetarian to eat in lieu of the racks of lamb that I was serving to the carnivores. 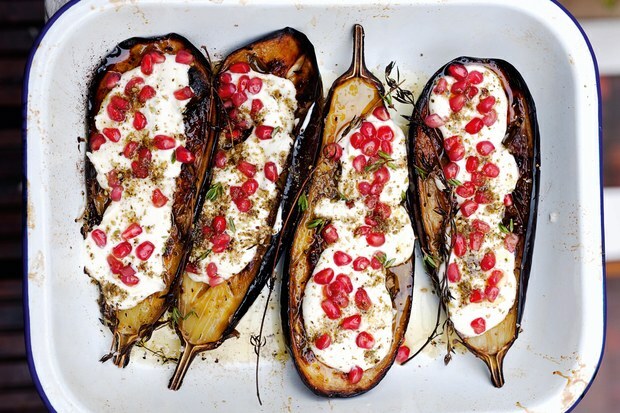 After searching through famed chef Yotam Ottolenghi’s book “Plenty,” I stumbled upon his recipe for roasted eggplant with a buttermilk yogurt sauce, topped with za’atar and pomegranate seeds. It fit all of my criteria and then some. It was special enough to stand on it’s own. It had seasonal elements, was healthy, and full of flavor. The cool buttermilk yogurt sauce was smooth and creamy against the texture of the roasted eggplant, and the pomegranate added a touch of sweet crunch. The fact that it came together quickly was a bonus. 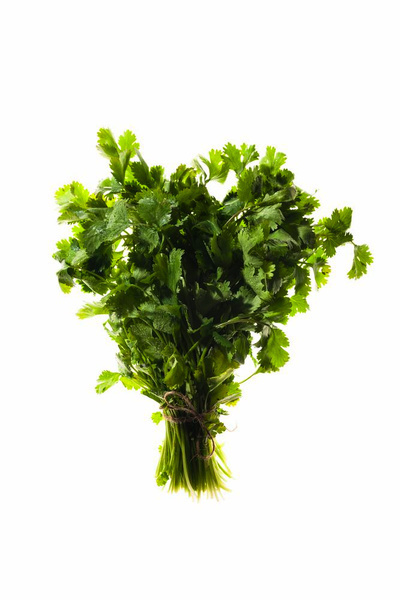 It’s no wonder that Mr. Ottolenghi chose this for the cover recipe of his book! Split 4 small eggplants vertically. Brush with olive oil until the pieces are fully saturated. The oil eggplant will absorb the oil, so be liberal with it. Sprinkle the halves with thyme leaves and salt and pepper. Roast in a 350-400 degree oven for about 30 minutes until the flesh is soft and they are nicely browned. Allow them to cool slightly. For the sauce, whisk together 1/2 cup of Greek yogurt with about 8 or 9 tablespoons of buttermilk and 1 1/2 tablespoons of olive oil. Stir in 1 clove of garlic, minced as finely as possible, or pressed in a garlic press, and a pinch of salt. 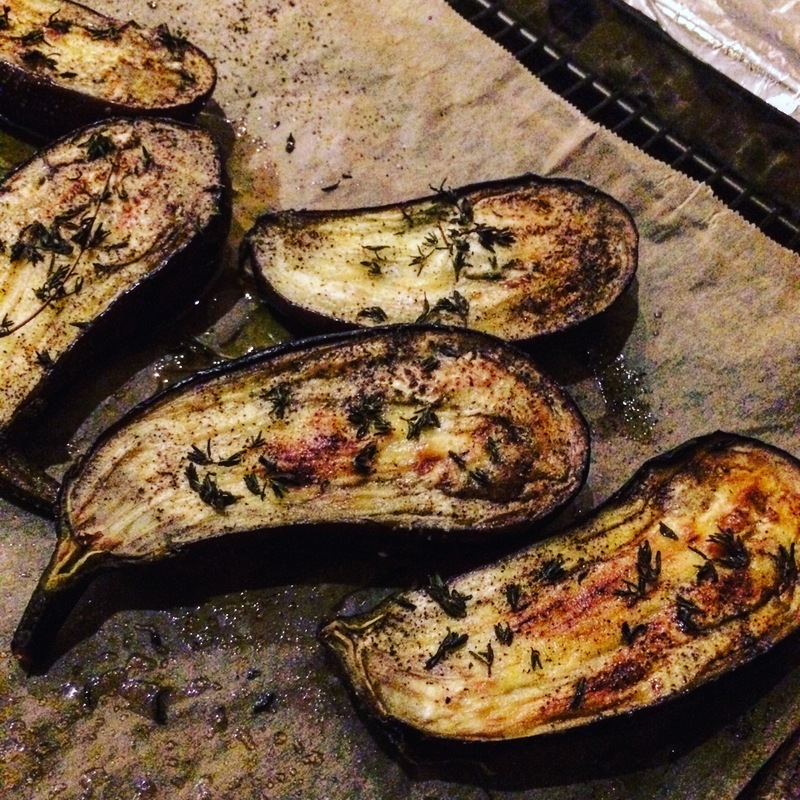 To serve, spoon the sauce over the eggplant halves, sprinkle them with za’atar* and pomegranate seeds. Drizzle with olive oil and enjoy! *Za’atar is a Middle Eastern spice mix. It is available at specialty markets, and it is also easy to make at home. Combine about 1 tablespoon each of oregano, ground cumin, salt, pepper, and sesame seeds. Many people also use sumac, but I didn’t have any and I didn’t miss it! Avocado toast has taken over the planet, in every iteration from simply smashed to decorative avocado roses. We just stumbled across this recipe for avocado butter from Alton Brown, and knew we had to try it. Oh the possibilities! Smear it on toast, rub it corn on the cob or spread it on a piece of fish. We could go on and on with ideas for this one. And then we saw a recipe on the Kitchn for tomato butter and started dreaming of it tossed with fresh pasta, topped on a piece of chicken or spread on bread. Whatever your fancy, these savory compound butters are a must try. 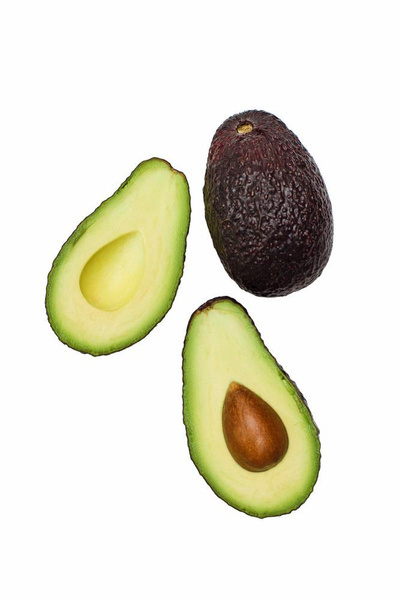 Combine 2 avocados, peeled and pitted with 1/2 stick of unsalted butter, a garlic clove, a healthy squirt or 2 of lemon juice, a small handful of cilantro leaves, 2 teaspoons of toasted cumin seeds and salt and pepper to taste in the bowl of a food processor. Process until well combined. Spoon the mixture onto plastic wrap and form into a log. 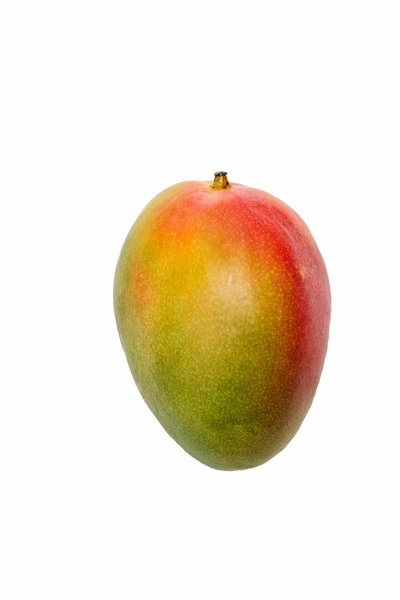 Refrigerate for several hours until formed. Slice and use as desired. 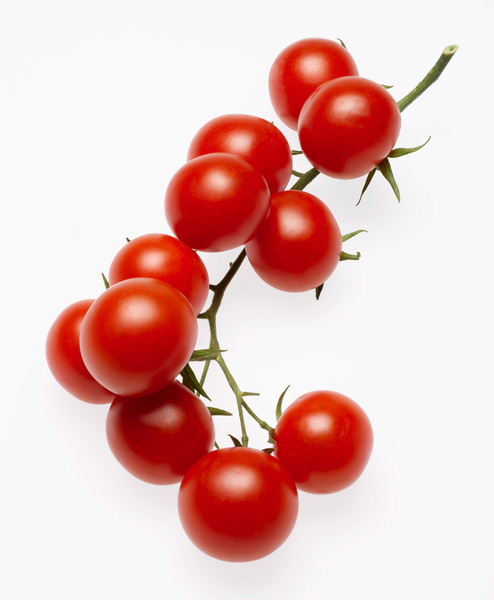 Combine the tomatoes with 2 sticks of unsalted butter, salt, a tablespoon of fresh thyme leaves and black pepper in the food processor. Pulse until the tomatoes are finely chopped and the mixture is well combined. You can roll this into a log as above, or put it in a crock in the refrigerator to store. This has been one of the hottest summers on the record books. 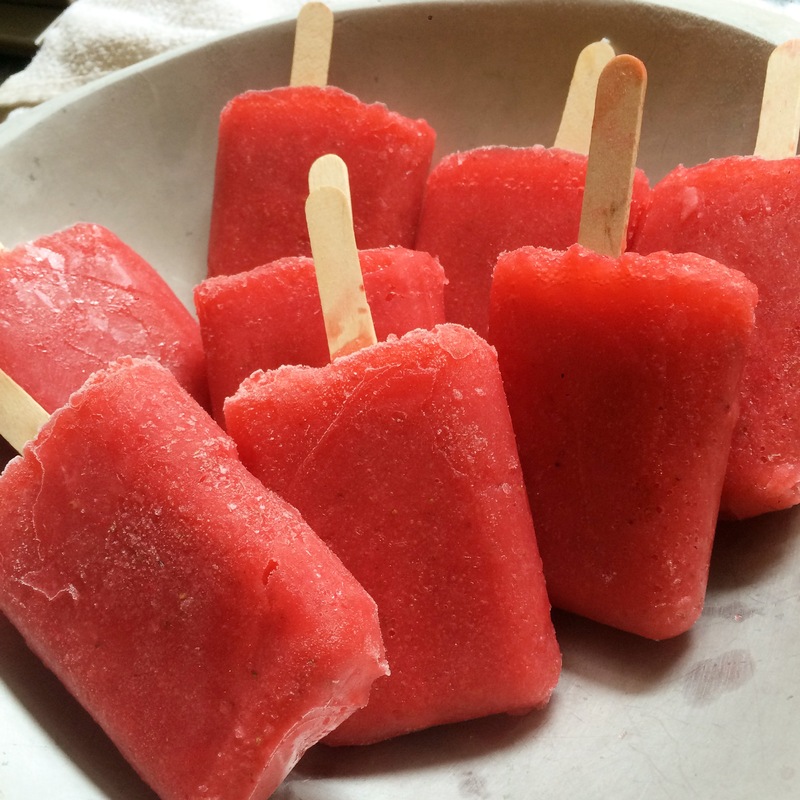 Cold rosé is being turned into “frozé” and cocktails are being frozen into pops to help beat the heat. 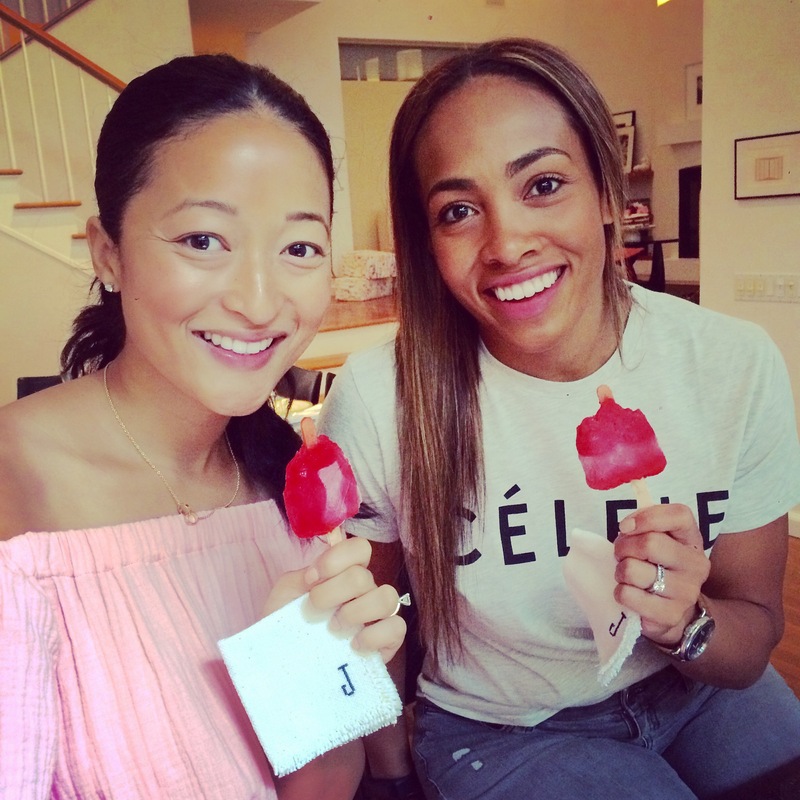 Last weekend, I hosted a few ladies for brunch, and we kicked off the day with a refreshing “poptail,” to get our party started. Later, as the guys came by to join us, they were starting to get a bit melted. No worries there; we simply plopped them in a glass and poured some champagne over them for a drink that was part kir royale, and part smoothie. Either way, it was a hit! While this recipe is super simple and tasty, you could take almost any summer cocktail and freeze them in ice pop molds with good results. Besides, isn’t everything better on a stick? Place 1 pound of strawberries, washed and hulled into the blender. Add about 1 cup of grapefruit juice (fresh is best, but unsweetened natural juice is fine too!) and puree until thick and smooth. Add about 5-6 oz. of vodka and blend. Pour the mixture into ice pop molds and freeze until the are just starting to solidify. Place the sticks in the molds and freeze until firm. To remove from the mold, run the bottoms under warm water to make them easier to pull out and enjoy! Last weekend, we went to a Mediteranean restaurant in the Village, and shared a few small plates and a bottle of rosé. The standout dish of the evening was grilled shrimp and watermelon. The combination was refreshing on a hot summer’s night, and completely delicious. The shrimp were grilled with fresh lemon and herbs, and drizzled with a little feta cheese. 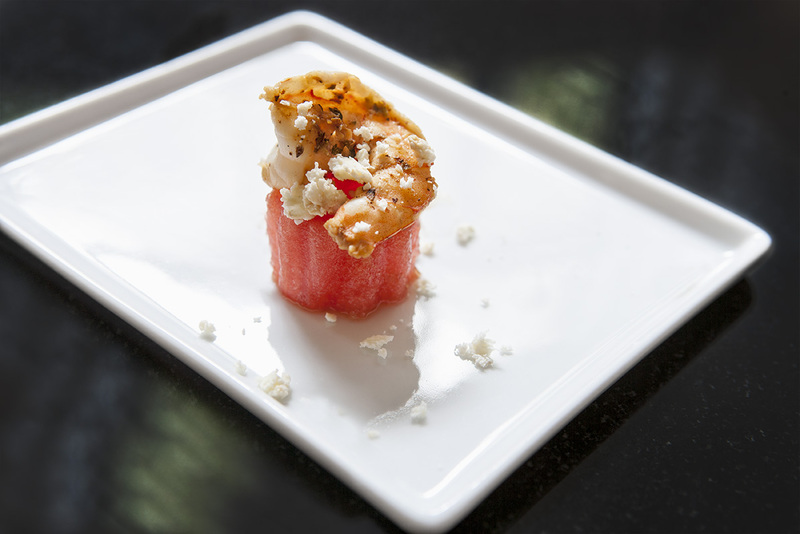 Each one was served atop a perfectly cut cube of watermelon, making the dish as visually exciting as it was flavorful. We couldn’t wait to try to whip up our own version at home. 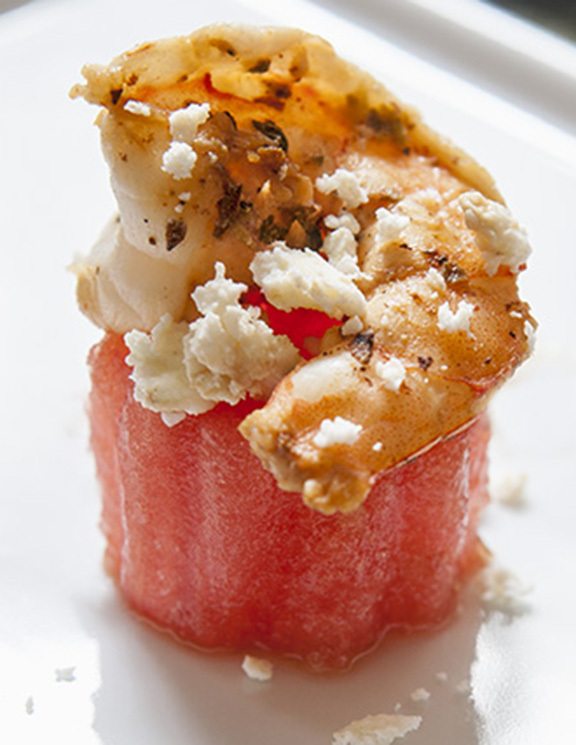 We thought this was good enough to be put on a pedestal, so we perched our shrimp atop a column of watermelon. If you want to speed up the process and serve it as a main course, go ahead and cube the watermelon in a bowl, drizzle it with aged balsamic vinegar, and crumble some feta on it. Serve the shrimp on the side. For the shrimp: Peel and devein the shrimp. Rinse and pat dry. Mix together the juice of one lemon, a large “glug” of olive oil, a clove or two of finely minced garlic, some dried oregano and fresh thyme leaves. Add the shrimp, and let them marinate in the refrigerator for 30 minutes to 1 hour. The shrimp will start to “cook” a bit from the acid in the lemon. Don’t over marinate, or they will become mushy. Remove the shrimp and sprinkle them with salt and pepper. Grill (we used a grill pan on the stove top) for a couple of minutes on each side until the shrimp are pink and opaque. Do not overcook! Assembling the dish: Drizzle a bit of aged balsamic vinegar* onto a serving plate. Line up the watermelon cubes on the plate and perch a shrimp on top of each one. Squeeze a little more lemon on them if desired. Crumble a bit of feta cheese over the top, and enjoy! * aged balsamic vinegar is usually sold in a smaller bottle than the regular type, and has been aged for a much longer period of time. 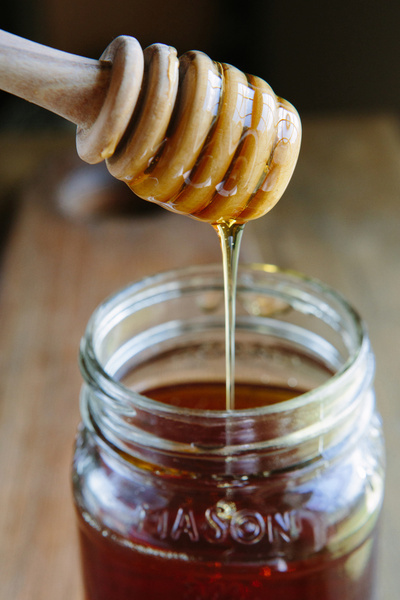 The result is a sweeter vinegar, and an almost syrup-like consistency. 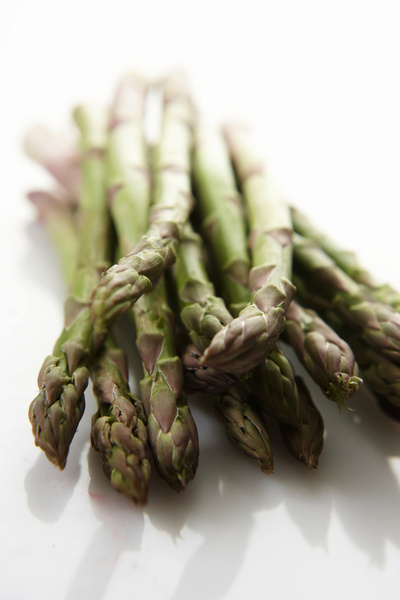 With spring comes showers, flowers and of course, asparagus. We usually roast ours, often with a sprinkling of parmesan cheese. 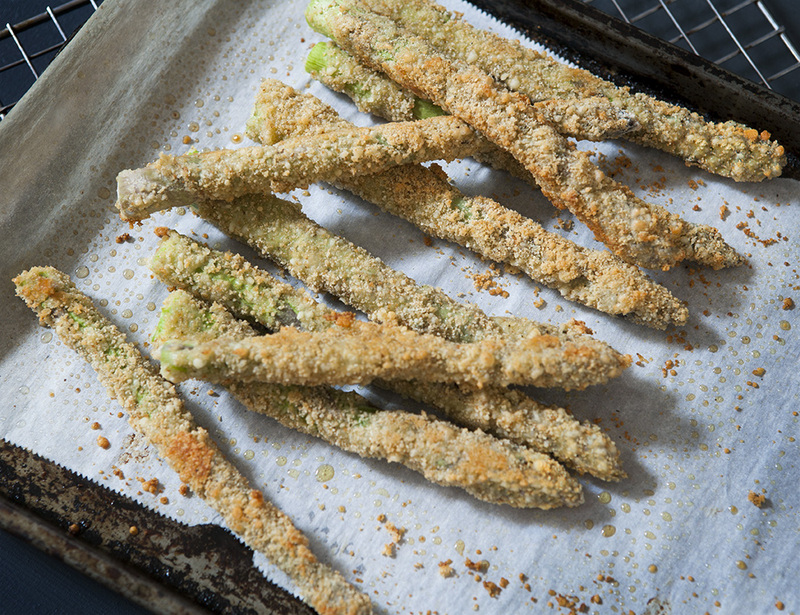 This unrecipe takes our asparagus game up a notch, by coating it with a blend of breadcrumbs and parmesan and baking it until it is crispy and crunchy. The best news is that because they are baked and not fried, they still maintain their healthy status! Wash the asparagus and trim off the tough ends of the stalk. 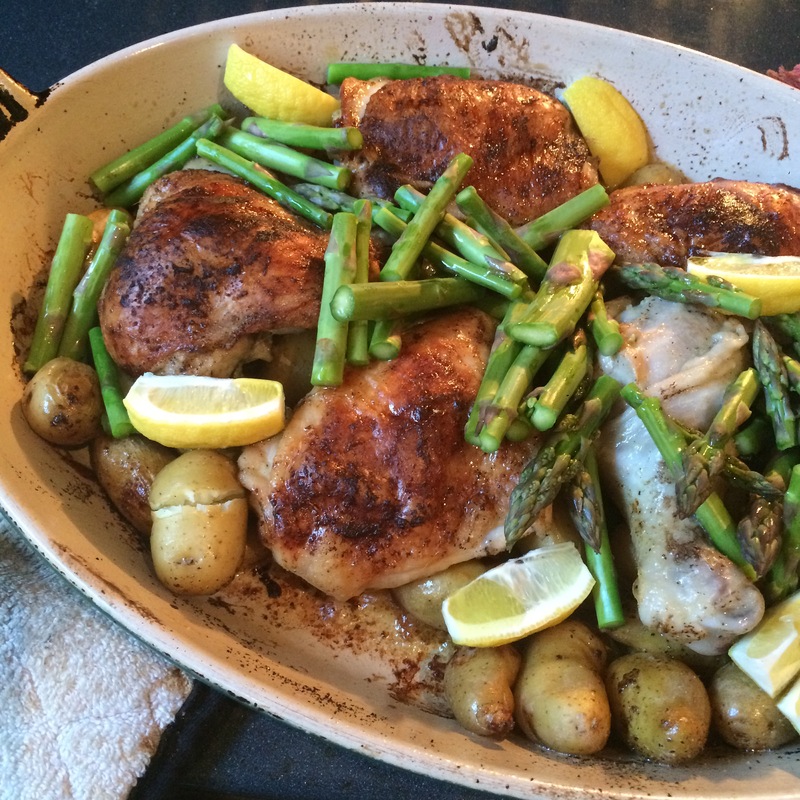 Cover a baking pan with parchment, and spray or brush it with olive oil. Prepare 3 dishes for breading: 1 with flour, 1 with an egg whisked with a tablespoon or two of olive oil, and another with breadcrumbs ( you can use regular, whole wheat or panko, a Japanese bread crumb, or a mixture of both) blended with an equal amount of grated parmesan cheese, and a little salt and black pepper to taste. Roll each asparagus spear first in the flour, then the egg mixture and finally in the breadcrumb / parmesan mixture. Place the breaded asparagus on the prepared pan and spray with olive oil. Bake at 425 degrees for about 12-15 minutes, turning after 8-10 minutes to ensure even browning. Remove from the oven when they are golden brown and cripsy. Sprinkle with sea salt to taste, and enjoy! For a more decadent experience, dip them in lemony hollandaise sauce!